The latest commission by Nance - Have a portrait of your pets done for $495.00. "We are so pleased with Nance's composition of our cats. She really captured their personalities. It's an amazing experience to see our beautiful cats painted with such skill compared to a simple photo. What a great experience working with Nance!" Unique gifts for people and their special pets! Give yourself or that special someone a Hand Painted, one-of-a-kind gift. Preserve your pet’s memorable expression and true personality. We custom paint your pets likeness on a wide variety of items. From affordable custom portraits ready to be framed to personalized pet travel carriers and more. All painted from your favorite pet's photo! 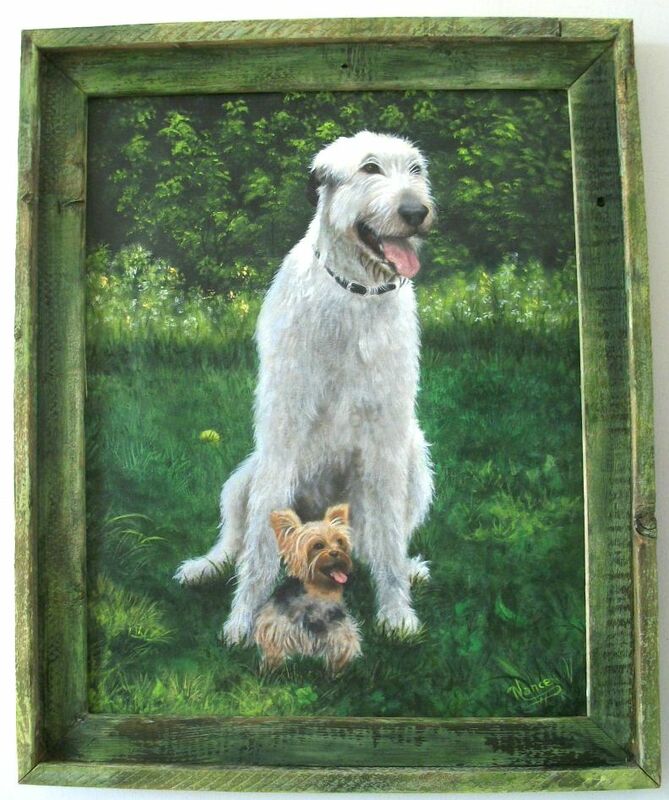 Have something special you would like to have YOUR pet’s portrait painted on? Customer provided items painted with return shipping FREE! Nance paints more than pet portraits; she paints landscapes, pet owners with their pets, family portraits, and reproductions of the old masters. Other subjects are welcome as well; we just need a good quality photograph or digital image. We specialize in custom pet portraits and landscapes on canvas. In addition, pet portraits on just about any personal item. Although pet portraits on canvas are our specialty, we love to get creative and paint portraits on one of a kind items such as caps, jackets, pet carriers, and more! Nance is committed to capturing the true personality of your pet. Just read some of her customers TESTIMONIALS. We hope you are inspired by our site and will order your own custom painted portrait of your beloved pet whether they be dog, cat, horse, or even your favorite landscape! Take your time surfing through our site and if you have any questions feel free to write us and email or call Nance directly. Here are two beautiful videos of Nance's work.